Adding cultural richness to the sophisticated, tech-oriented city of San Jose is an ethnically diverse population, including 1/4 million Latinos and nearly a quarter million Asians. 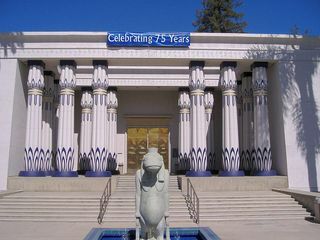 Add to this the history of 17th century Spanish colonization, and a flowering of architecture during the Victorian and Gold Rush eras of the 1800s, and San Jose is the cultural heart of California’s Silicon Valley, a treasure chest waiting to be opened. 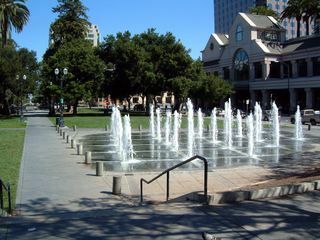 The downtown is anchored by leafy Plaza de Cesar Chavez Park, where annual festivals are held, from Vietnamese New Year Tet to the Mariachi and Mexican Heritage Festival. Involving several hundred artists, the Tapestry Arts Fest happens in the park and on outdoor stages for blocks around. Based at the parkside Fairmont San Jose, Michael and I spent a few days exploring. We walked to nearby performing arts halls for ballet, symphony, comedy and theater, and to the mango-bright Tech Museum of Innovation to see robots, astronauts and an IMAX film. Just down the block, the ultra-contemporary collection in the San Jose Museum of Art is housed in a monumental Romanesque edifice built in 1892; and, beyond that, the 1877 Cathedral Basilica of St. Joseph is a soaring extravaganza complete with double bell towers, an impressive columned façade and a whopping dome encircled with saints and topped in dazzling blue stained glass. We took a private tour of the Rosecrucian Museum, which displays the largest collection of Egyptian artifacts in western North America. At least once in your life, make a point of getting here to see the golden adornments of the pharoahs, a gang of mummies, images of gods and goddesses, the spooky reproduction of the Temple of Amon, and much more. Established in the 1920s and studded with rare specimen trees, the glorious gardens, alone, are worth the visit. Just northeast of downtown, the streets of the Hensley Historic District are lined with Victorian-era mansions and homes, particularly on Third Street, while just north along Jackson Street is one of the three remaining Japantowns in the country. Among annual events are the Japanese Obon Festival, the Kimonoand Vintage Sale (incredible offerings of antique obis, kimonos, ceramics, dolls, Samurai swords, paintings and hangings), and the Nikkei Matsuri Festival. The oldest rstructure in San Jose, also within walking distance of Chavez park, the Peralta Adobe-Fallon House Historic Site is comprised of a 1797 adobe and the 1858 Victorian mansion, both open for tours. Nextdoor, the San Pedro Market is a super-fun destination for enjoying ethnic food and libations at tables under the trees. The city’s best known architectural icon, a Queen Anne Victorian spectacle of turrets, towers, cupolas, cornices, and balconies, the Winchester Mystery House is another “must see”. Guilt-stricken by the thought of how many people had been killed by the Winchester rifle, which was manufactured by her husband’s company, beginning in the late 1800s, Sarah Winchester kept hundreds of workmen busy for years building a masterpiece––or a monster, depending on how you see it. Stairways and doors lead nowhere, windows open to walls, hallways twist and secret passageways are scary. Gold-plated chandeliers, Tiffany art glass windows, weird bathtubs and rare wood parquet floors are just a few things to see. Stay with your tour guide to avoid getting lost! and nearly 20 restaurants with a glorious garden plaza where live music and entertainment take place on weekends. We like to come here at the end of our weekends, to stroll around and watch the denizens of San Jose having fun. Last time we listened to a Caribbean band and mariachis, and watched a Latin dance troupe and a children’s gymnastics performance. 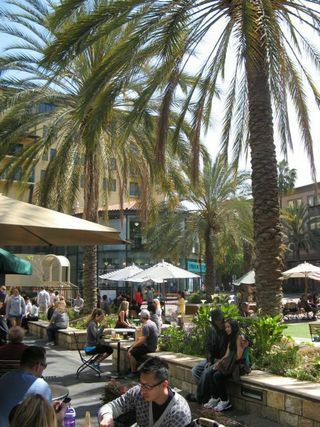 You can arrange for a guided walking tour through San Jose’s “Walks and Talks”.